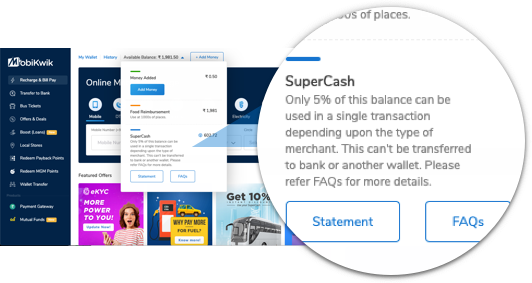 SuperCash can be used across categories mentioned in the app. You can save flat 5% of your transaction amount, i.e., 5% of the transaction amount will be deducted from your SuperCash balance (up to ₹750). On platforms where you pay your bills, like - PSPCL, DGVCL, Tikona, etc., 5% of your SuperCash will be deducted on a minimum transaction amount of ₹500. You can use SuperCash in 3 transactions a day and 30 transactions (maximum ₹1000 SuperCash) in a calendar month if you have completed KYC with OTP verification (eKYC). Users who have submitted details without OTP verification (minimum KYC) can use up to ₹100 SuperCash and users without any form of KYC can use ₹50 SuperCash in a calendar month. Users cannot use SuperCash more than once in a day on a single sub-category from Recharge and Bill Payments (like prepaid mobile, post paid mobile, DTH recharge, water bill, etc.). For example, if you have utilized SuperCash today on post paid mobile bill payment, you will not be able to use it again on another post paid mobile bill payment today, however, you can still use SuperCash on DTH recharge or electricity payment on the same day. One user can use up to ₹350 SuperCash in a calendar month on Recharge and Bill Payments category. However, users can use SuperCash thrice in a day on a single merchant (like Zomato, Big Bazaar, Jabong, petrol, milk etc.). For example, if you have utilized SuperCash thrice today to book your flights and hotel from MakeMyTrip.com, you will not be able to use it again on it today, however, you can still use SuperCash on Yatra or Swiggy on the same day. SuperCash usage is restricted on payments done through MobiKwik Visa Exclusive. You can maximise your savings on Ola rides booked via MobiKwik. Use 25% (up to ₹30) on first 5 rides, which will be followed by 5% (up to ₹750) SuperCash usage from your 6th ride onwards. *Cashback/Vouchers will not be processed for non-KYC users. Get your KYC done to receive the cashback. Please ignore if KYC is already done. **Promo codes are subject to maximum cash back amounts. *Cashback/Voucher acquired from promo codes to be credited within 24 hours of your product being shipped. *Cashback/Voucher received will be credited to your Paytm Wallet. * If product purchased on EMI payment mode, Cashback/Voucher gets credit post return policy. Cancellations are not allowed for the product once ordered.